The ECS Toyota Young Investigator Fellowship kicked off in 2014, establishing a partnership between The Electrochemical Society and Toyota Research Institute of North America, aimed at funding young scholars pursuing innovative research in green energy technology. The proposal deadline for the year’s fellowship is Jan. 31, 2017. Apply now! While you put together your proposals, check out what Patrick Cappillino, one of the fellowship’s inaugural winners, says about his experience with the fellowship and the opportunities it presented. The Electrochemical Society: Your proposed topic for the ECS Young Investigator Toyota Fellowship was “Mushroom-derived Natural Products as Flow Battery Electrolytes.” What inspired that work? Patrick Cappillino: This research was inspired by a conversation with a colleague. I was relating the problem of redox instability in flow battery electrolytes. He told me his doctoral work had focused on an interesting molecule called Amavadin, produced by mushrooms, that was extremely stable and easy to make. The lightbulb really went off when we noticed that the starting material was the decomposition product of another flow battery electrolyte that has problems with instability. Starting in 2014, ECS partnered with Toyota Research Institute of North America to establish a fellowship for young researchers working in green energy technology, including efforts to find viable alternative energy sources as a replacement for oil, reduce carbon dioxide emissions, and prevent air pollution. The proposal submission deadline for the 2017-2018 ECS Toyota Young Investigator Fellowship is Jan. 31, 2017. As we gear up for the third year of fellowship, ECS is checking in with two of the inaugural winners. Yogesh Surendranath, Assistant Professor of Chemistry at Massachusetts Institute of Technology, was one of the inaugural fellowship winners for his work in methane to methanol conversion. ECS, in partnership with the Toyota Research Institute of North America (TRINA), a division of Toyota Motor Engineering & Manufacturing North America, Inc. (TEMA), is requesting proposals from young professors and scholars pursuing innovative electrochemical research in green energy technology. 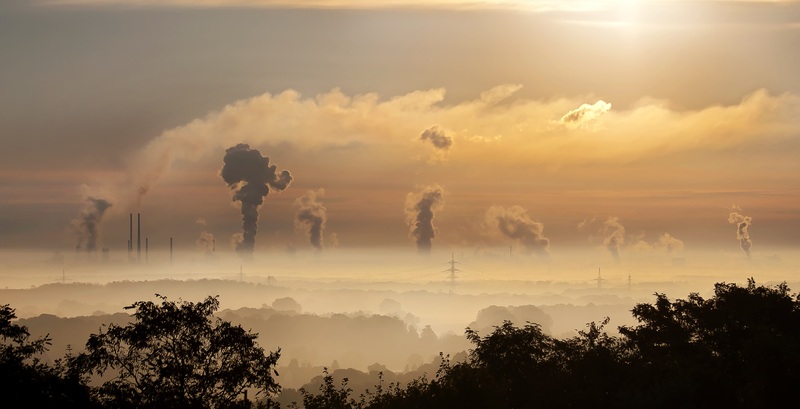 Global development of industry and technology in the 20th century, increased production of vehicles and the growing population have resulted in massive consumption of fossil fuels. Today, the automotive industry faces three challenges regarding environmental and energy issues: (1) finding a viable alternative energy source as a replacement for oil, (2) reducing CO2 emissions and (3) preventing air pollution. Although the demand for oil alternatives—such as natural gas, electricity and hydrogen—may grow, each alternative energy source has its disadvantages. Currently, oil remains the main source of automotive fuel; however, further research and development of alternative energies may bring change. The purpose of the ECS Toyota Young Investigator Fellowship is to encourage young professors and scholars to pursue research in green energy technology that may promote the development of next-generation vehicles capable of utilizing alternative fuels. Electrochemical research has already informed the development and improvement of innovative batteries, electrocatalysts, photovoltaics and fuel cells. 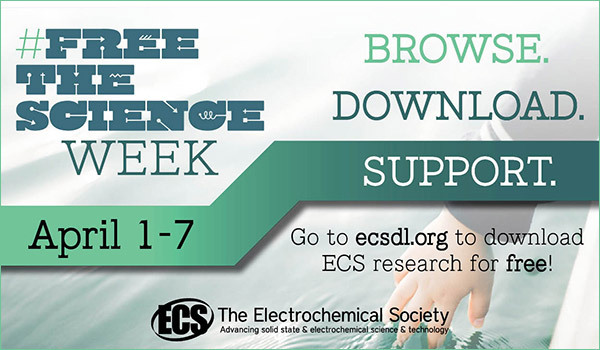 Through this fellowship, ECS and TRINA hope to see more innovative and unconventional technologies borne from electrochemical research. The fellowship will be awarded to a minimum of one candidate annually. Winners will receive a restricted grant of no less than $50,000 to conduct the research outlined in their proposal within one year. Winners will also receive a one-year complimentary ECS membership as well as the opportunity to present and/or publish their research with ECS. The ECS Toyota Young Investigator Fellowship Selection Committee has selected three recipients who will receive a minimum of $50,000 each for fellowships for projects in green energy technology. 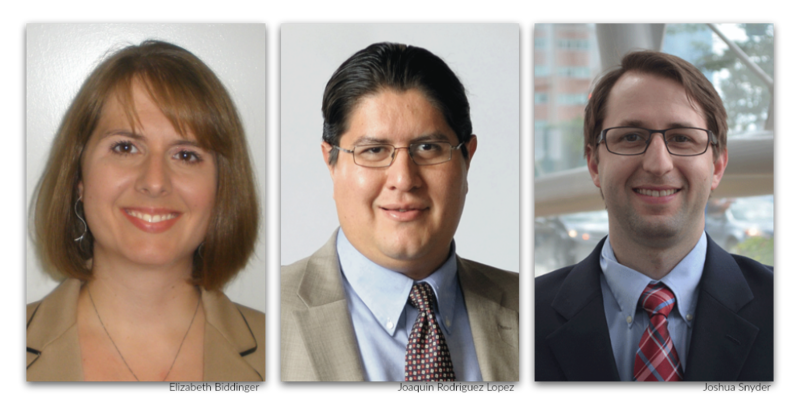 The winners are Professor Elizabeth Biddinger, City College of New York; Professor Joaquin Rodriguez Lopez, University of Illinois at Urbana-Champaign; and Professor Joshua Snyder, Drexel University. 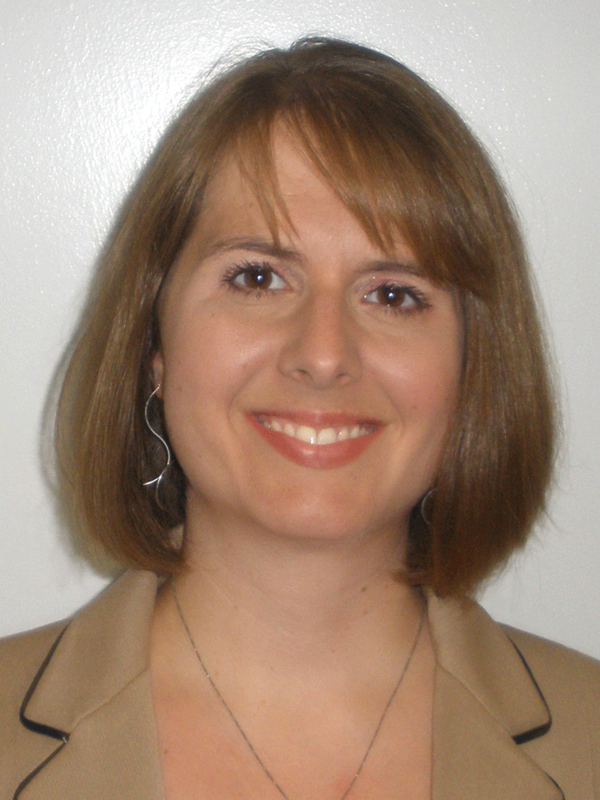 The ECS Toyota Young Investigator Fellowship, a partnership between The Electrochemical Society and Toyota Research Institute of North America (TRINA), a division of Toyota Motor Engineering & Manufacturing North America, Inc. (TEMA), is in its second year. A diverse applicant pool of more than 100 young professors and scholars pursuing innovative electrochemical research in green energy technology responded to ECS’s request for proposals. David Go has always seen himself as something of a black sheep when it comes to his scientific research approach, and his recent work in developing clean alternative fuels from carbon dioxide is no exception. In 2015, Go and his research team at the University of Notre Dame were awarded a $50,000 grant to purse innovative electrochemical research in green energy technology through the ECS Toyota Young Investigator Fellowship. With a goal of aiding scientists in advancing alternative energies, the fellowship aims to empower young researchers in creating next-generation vehicles capable of utilizing alternative fuels that can lead to climate change action in transportation. While advancing research in electric vehicles and fuel cells tend to be the top research areas in sustainable transportation, Go and his team is opting to go down the road less traveled through a new approach to green chemistry: plasma electrochemistry. 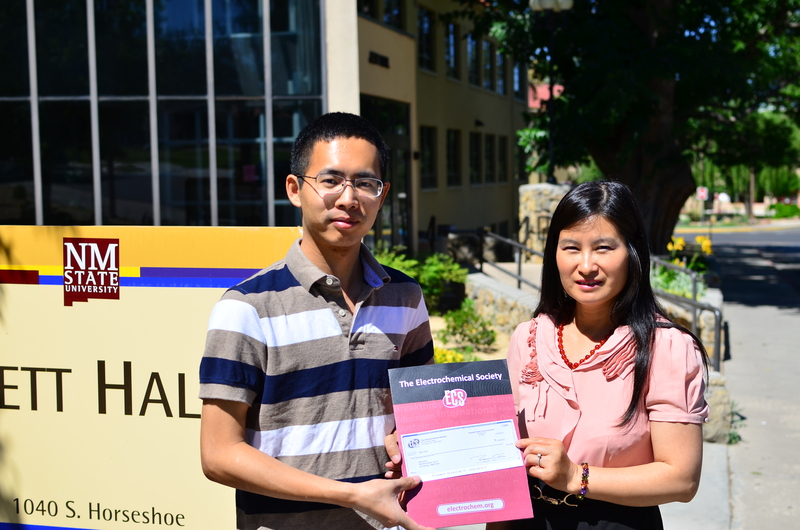 From New Mexico State University, Dr. Luo presents award check to ECS Student Member & ECS Edward G. Weston Summer Fellowship Recipient, Mr. Chen. Beginning in 1928, these awards have been established over the years to assist students during the summer months in pursuit of work in the field of interest to The Electrochemical Society. 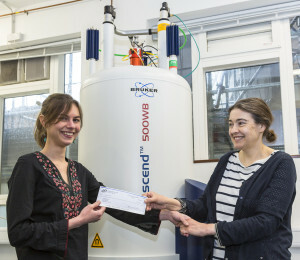 University of Cambridge Ph.D. candidate, Raphaële Clément (left), receives her ECS 2015 Summer Fellowship award check from adviser & ECS member, Professor Clare Grey (right). Are you interested in supporting the ECS Summer Fellowship program or creating a new fellowship through ECS? Contact us for more information. Each year ECS awards up to five Summer Fellowships to assist students in continuing their graduate work during the summer months in a field of interest to the Society. Congratulations to the five Summer Fellowship recipients for 2014. The Society thanks the Summer Fellowship Committee for their work in reviewing the applications and selecting five excellent recipients. Applications for the 2015 Summer Fellowships are due January 15, 2015.